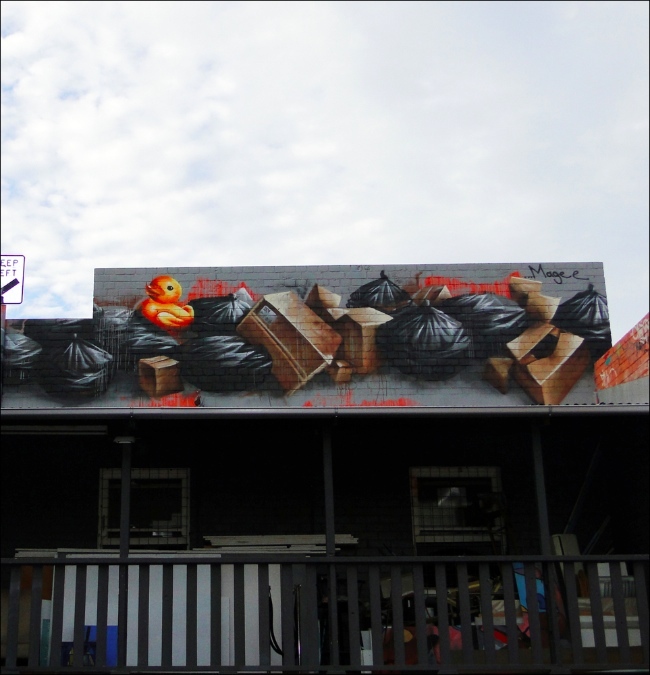 We met Fintan Scott-Magee originally from Brisbane and try to find out a bit more about his liking, it seems, for rubbish and bins in his art. A-P: Tell us about yourself in a few words? FINTAN MAGEE: My name is Fintan Magee, born in Brisbane Australia. I have been writing for 10 years now but I started to move away from traditional letterforms about 4 years ago and started to paint more canvas and street art. Really I’m just trying to have as much fun as possible with my art while I am still young and stupid enough not to know better. A-P: What is your process/approach when making graffiti/streetart/art? FM: I prefer to paint strait onto walls using oils, acrylic and of course spray paint. I like to paint in abandoned buildings a lot so I can relax and paint for as long as I want, the problem is my city is growing very quickly and becoming so developed that there is a shortage of empty and forgotten spaces. In my city almost everything painted on the streets is buffed within a week so I don’t really do many paste up’s or stickers any more, they say my city is clean but I just find it sterile. A-P: Bin bags, rubbish seems to be an element that you like, why is this? 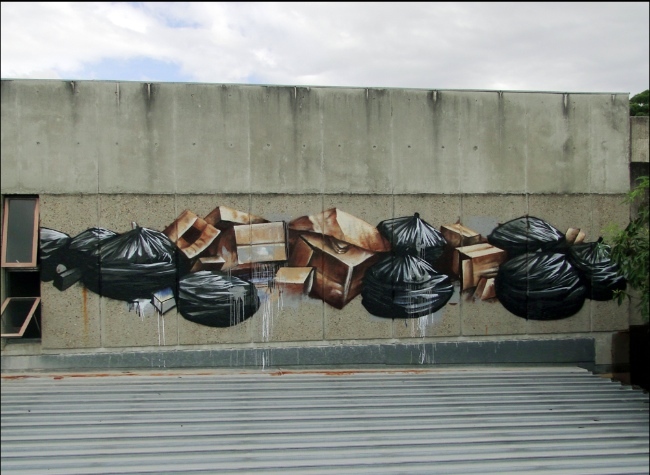 FM:The rubbish is just something thats developed over the last few months because I was painting still life images of things that have been forgotten or left behind on the streets, I guess I like to add depth to what may be considered bland or boring subject matter and not worth painting. I believe that we live in such a throw away and progressive society now that we overlook the beauty in many things that we consider expendable. A-P: Where/what do you look for inspiration? FM: I guess I look everywhere for inspiration, I think as an artist its important to take in the simple things around you, popular culture, nature, the city, your friends, etc. Keep looking and you will eventually find inspiration and influence where you least expect it. FM: I am travelling to Sydney and Melbourne in June for some group shows and to do some walls, I also have a Solo show at Jugglers gallery in Brisbane in August and another solo show in Melbourne’s Rtist gallery in November. After that I think another overseas trip is on the cards, possibly to the Americas. I have been back in Australia for two years now and I am starting to get pretty itchy feet.